Standard: Children demonstrate the understanding of concepts, experiences, and ideas through symbolic representation. 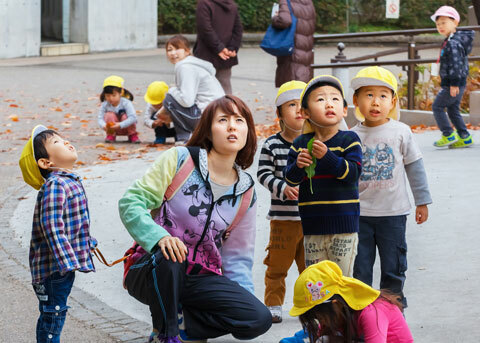 Children learn about objects, actions, and people through observations, interaction, and exploration. 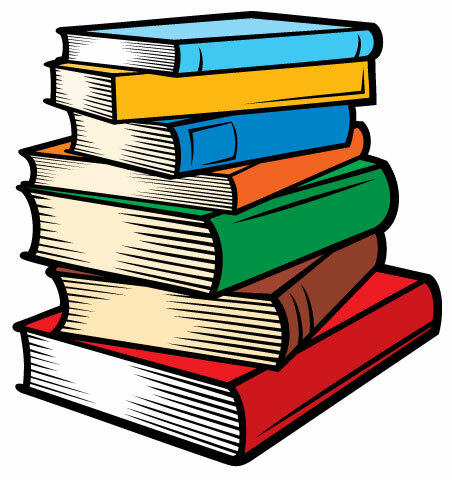 They take information in through all of their senses to build a basic understanding of the world around them. By eight months of age, children develop object permanence—they know that objects and people continue to exist even though the objects and people can no longer be seen or heard. This realization is why children cry when their caregiver leaves the room, or why they look under a blanket to uncover a toy. Children need object permanence in order to develop symbolic thought. As they grow, children continue to explore their environment and play with objects the way they are intended to be used. Children will push a toy car around the room, or hold a toy phone up to their ear. 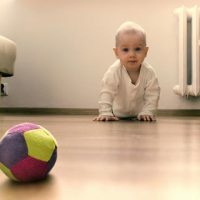 Language development is closely related to this cognitive skill, as children use words to represent meaningful people and objects in their lives, for example, “baba” for bottle, or “dahee” for the family dog. True symbolic thought emerges around 18 months of age with children’s ability to think in images and symbols.1 Children represent concrete objects by using images, words, gestures, or play. For example, children may use a wooden block as a phone during play. Or, they may pretend to cook food in the toy kitchen. Play becomes increasingly symbolic, as children use pretend play to make sense of the world. 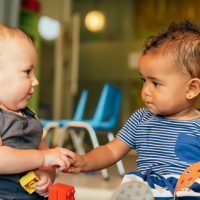 By 36 months, children can use symbolic play to problem-solve, sort out feelings, and explore roles and relationships. 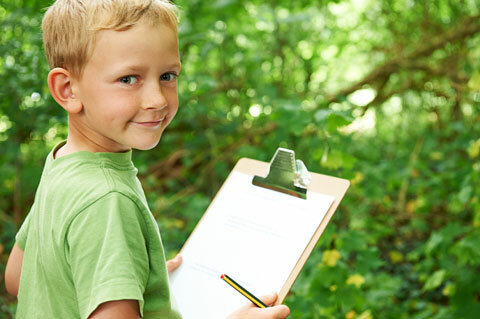 Children use observation, exploration, and social interaction to learn about objects, actions, and people. Children use social interaction to continue to gather meaning from objects, actions, and people. 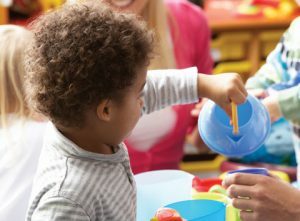 Children move from exploring objects to learning how to play with objects in ways they are intended to be used. Toward the end of this age period, children begin to use one object to represent another object. Children demonstrate the beginning of symbolic thinking as they start to label objects in everyday life. Children also use more complex social interactions and engage in imaginary play to make sense of the world around them. Children use their ability to label and think symbolically to engage in increasingly complex social interactions, exploration, and play. Children use these skills to recreate experiences, problem-solve, and explore relationships and roles. Jocelyn, 34 months old, is playing with a doll house. Her caregiver, Lauren, sits near her but does not engage with her. Jocelyn picks up a doll and moves her around in the play kitchen. She says, “Come eat!” Jocelyn puts down the doll, and grabs a smaller doll from the upstairs part of the dollhouse. She moves the doll into the kitchen and says, “Here, Mommy.” Jocelyn picks up the “Mommy” doll and places them both on the table. She turns toward Lauren, and hands her a third doll. Jocelyn points to that doll and says, “Daddy.” Lauren says, “Do you want me to be the Daddy?” Jocelyn nods her head and turns her attention back to the doll house. She points to the play living room and says, “Daddy sit.” Lauren places the doll on the miniature couch. Jocelyn grabs both her dolls and places them next to the “Daddy” doll. She then leaves the dollhouse and walks over to the table right next to the dollhouse where there is a play cash register. She presses a few buttons, and then it opens. Jocelyn takes out a few pretend bills and hands one to Lauren. Lauren says, “Thank you! I am going to buy a piece of fruit.” Jocelyn bends down, and reaches toward the basket that is under the table. She picks out a pretend apple and hands it to Lauren. She then takes the bill out of Lauren’s hand and puts it back into the register. THIS EXAMPLE HIGHLIGHTS Jocelyn’s developing cognitive skills. Jocelyn first uses the dolls as a representation of her family and has them take on specific roles. She is able to demonstrate delayed imitation and symbolic thought by performing two sequences that she is familiar with: dinner and sitting together as a family. She uses language to indicate what is being represented and to engage her caregiver in play, when she hands Lauren the “Daddy” doll and again when she hands Lauren the pretend bills. Jocelyn also demonstrates her memory skills as she bends down automatically to get Lauren a piece of pretend fruit without having to look around. Finally, Jocelyn shows a basic understanding of quantity as she hands Lauren one piece of fruit, after Lauren communicates that is what she wants. ← Previous Outdoor Field Trips with Preschoolers: Being There!